This week has long been one of my favorites in the church year. Who can resist the sweetness, purity, power and goodness of all these saints and angels celebrated in one week! September ends with the celebration of the great heavenly warrior St Michael, and he is followed a day later by St Therese of Lisieux who everybody loves. Then as if to celebrate her Little Way of spiritual childhood further we pile on the Feast of the Holy Guardian Angels, then a day later more super attractive sweetness in St Francis of Assissi. Michael, Therese, Guardian Angels, Francis…it’s almost too much for those who love the Lord and love his saints. But hang on. Stuck there between St Michael and St Therese is Jerome. He’s there like one of God’s great jokes in this most holy week. Jerome? Jerome the patron saint of curmudgeons? Jerome the misogynist grump? Jerome the not politically correct, intellectual who didn’t do small talk and was (to put it mildly) not inclined to suffer fools gladly? That’s right. Jerome. 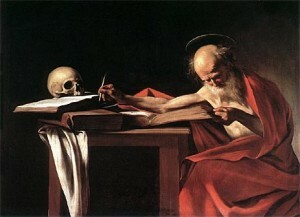 SAINT Jerome. Born around the year 340 Jerome began a scholarly life from an early age. He studied at Rome and Trier, retired to the desert to live in a cave, made friends with St Gregory Nanzianzus, Pope Damasus and at the same time made lots of enemies. He not only translated the Bible into Latin, but wrote controversial essays, theological works and was a translator. He ended up living as a monk in Bethlehem, dying at the age of 80. Jerome was kind of like the Michael Voris of his age. He attacked just about everybody for anything. He was at heart an extremist, a radical ascetic and a recluse. We must remember that in the late fourth century Christianity had become the official religion of the Roman Empire. The early days of austerity, persecution and being an underground movement were over and the church had to cope now with the problems of worldliness. He also didn’t have much time for poncy clergy who fuss over their clothes. In a letter to Eustochium he writes with scorn of certain members of the Roman clergy. “All their anxiety is about their clothes…. You would take them for bridegrooms rather than for clerics; all they think about is knowing the names and houses and doings of rich ladies.” Indeed. They are with us today–cissy priests who spend all their time fussing over pretty vestments.